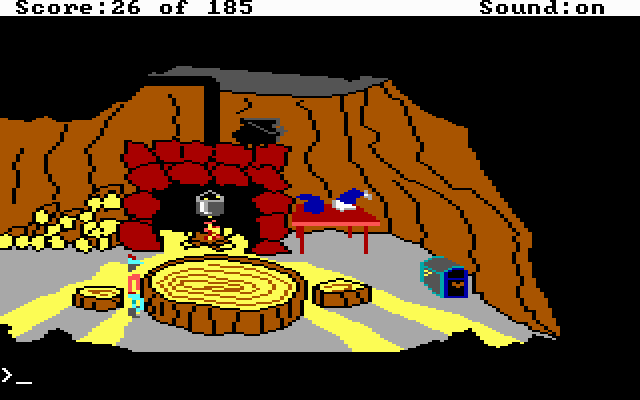 King’s Quest II came out under a year after the original, which is probably a clue right there that the sequel was scrambled out too fast to create anything really unique. You pick up a short time after the first game ends – you’re still the gallant Sir Graham, now King Graham, sitting in the throne of Daventry. The kingdom is healthy once more, all is well, and you look quite slouchy and bored with your new responsibilities. We learn in the opening cutscene that Graham pines for a wife. He consults his magic mirror and learns there’s a ripe queen-in-potentia waiting in the land of Kolyma. You don your adventuring cap and head out to the nearby land. Functionally, the game is identical to the first. It’s still an AGI game, the parser remains, you still control Graham with the arrow keys and must march him close to anything you want to interact with. The idea of building the kingdom with wrap-around screens also continues; though Kolyma only “wraps” from top to bottom. Left and right edges are blocked off by an ocean and mountains, respectively. This keeps the basic idea of a seamless world while helping the game feel a touch more realistic and larger than it actually is. Various pieces of scenery still hold secrets worth investigating, and a wealth of jewels and magical objects can once again be found by sticking your hand recklessly into rotten tree stumps or curious-looking cracks in rocks. Once again you’re searching for three items as the goals of three different tasks. Whereas before you were hunting for the thieves of Daventry’s treasure, here you are looking for keys to the magic door – which you’ll find is actually three magic doors in sequence, like the intro to Get Smart. Each door has an inscription giving you an obscure, yet cheesy suggestion of where to look for the key. They’re never clear enough to tell you exactly where to go, but clues like “To find this key, you must set your sights high” will remind you to start looking once you manage to actually get to a high place. The right item will let you travel underwater. Once again a working knowledge of classic fairy tales will be required to solve many of the puzzles, and this time there’s some Transylvanian and Roman mythology thrown in as well. Hope the kids studied up on Neptune. It results in another game hopefully generic enough for everyone to play and solve, but that takes the dangerous position of assuming everyone will assuredly know the stories it is based upon. Once again, few to no clues are provided in-game for the various puzzles. You should have no trouble figuring out what to do if you’re familiar with the source material, but quite a bit if you aren’t. The game also throws a bit of unnecessary cruelty at you. 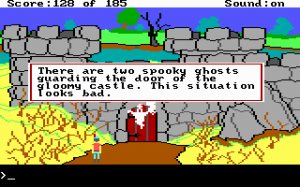 The first game had random enemies that could appear on certain screens and steal items from you or cast spells that would end your game. Both return here, and now certain story-related characters are also randomized. It was no big deal if you went to a screen and an annoying enemy wasn’t there. Here, you’re expected to keep leaving and re-entering a scene until the randomized encounter gets triggered. As an example, you have to give an item to Red Riding Hood, but must wander around until you “happen” upon her. Worse, you are never explicitly told you need to seek her out, you just kind of guess that she should be somewhere in the game based on one of the location. You definitely aren’t told that you have to wait for her to appear at random on one of the screens. I don’t know how long you’re expected to walk around, but even after I found the screen in a walkthrough, it still took maybe ten passes before she appeared. I feel comfortable saying that I never would have figured this out on my own. Make damn sure you have a reason to cross the bridge every time. 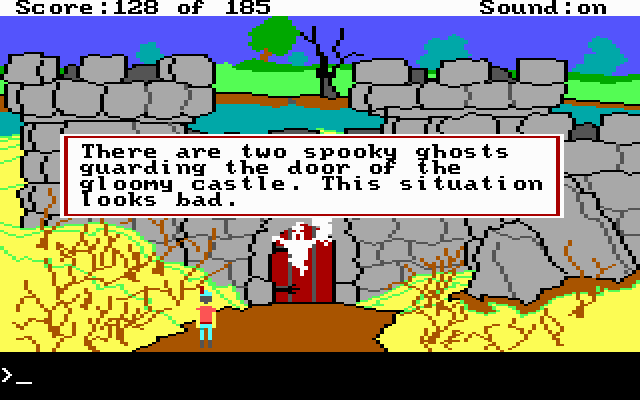 The other notable point is that the magic doors are accessed by a rickety bridge. Since the doors are the goal of the entire game, you have to cross the bridge. 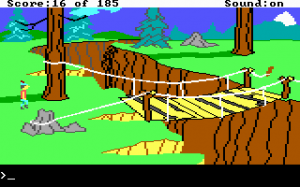 You can cross this bridge only seven times – and you must cross it exactly seven times in the course of the game. You’re never told about this precise limit. Naturally I’m irate because this little trap snared me on the third door, forcing me to start over all the way from the beginning. It can only be intended to ruin your game just as you’re about to finish it, because the end of the game is the only time you’d come close to the limit. I suppose that’s a way to draw out the length, but I don’t think poking your customer in the eye is a wise way to do it. Police Quest‘s seemingly random deaths could at least be explained by fault of procedure and avoided by reading the manual. The parser gets a few improvements as well, and generally seems to know a few more synonyms than last time. Typing “look” or “look around” will now highlight important areas in the description of the area, and more importantly, give you the correct word for what you want to search. 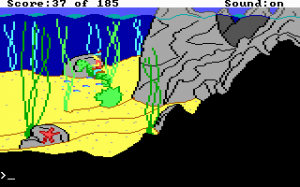 So reading “There’s a hole in that nearby rock” tells you to type “look hole” and off you go. You’ll still be doing endless wandering, made worse by Graham’s ponderous foot speed, but now you can take a pretty good inventory by at least walking onto every screen and typing “look around.” This helps you get your bearings and distinguish between different screens, and becomes absolutely invaluable later. It also reduces the chance of being unable to finish the game because you missed an important item. Detail is still pretty great for such a low resolution. The game also expands on the multiple solutions from the first game. Again, I can think of only one situation in the original that featured a greater and lesser solution, while here you will get a number of them that affect your ending point score. You can also trade away valuable treasure (with subtracted points) for the easiest solution of them all. This can be a bit of an issue, as you generally won’t know until the end if you used an optimal solution. But for those not concerned with their score, it at least allows you to finish the game without forcing you to figure out the super-clever option. 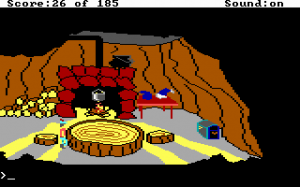 The Sierra humor also begins developing in this game with some amusing animations and a few Easter Eggs scattered around; the most famous being the Batmobile roaring out of a cave, complete with Al Lowe’s rendition of the theme. Kolyma is made up of the same colors as the first game, but with new artwork and new locations. There’s no update to the graphics at all, so these new locations look like unseen areas in Daventry, or an expansion pack to the first game. They are also just reimaginings of those found in the first – lakes, caves, sparse forests, etc. I’m not particularly disappointed by this or was expecting anything radically different, but it is another indication of the rush to produce a sequel. Sounds are as sparse and scattered as in the first, which isn’t a bad thing. They come from the PC speaker and add a little ambience when needed. Another candy-coated adventure based on classic fables. Still short on story. Graham isn’t a character you can care about yet, so much as a device for moving the game along. This is a poisoned lake! Too bad, you die of extreme poisoning.